PREVENT future engine problems with Gas Tank Shield. Suitable for both neat or mixed petrol, Quick and easy to use. 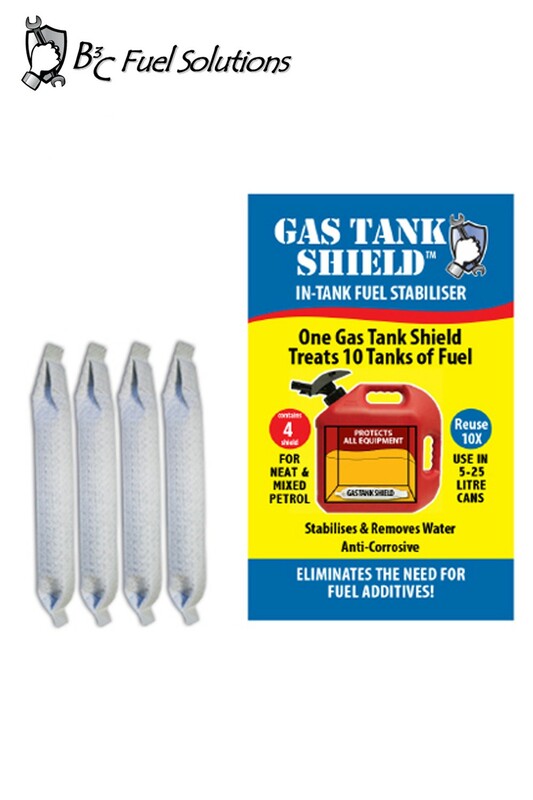 Just pop one into your fuel can/tank and Gas Tank Shield will stabilise the fuel and the remove water attracted by the ethanol found in modern fuel. Gas Tank Shield is part of the multi award winning family of fuel solution products from B3C. This product range is scientifically engineered to provide a quick, easy, and effective means to TEST - FIX - PREVENT the problems associated with modern day fuels. Application: Prevent future engine problems with Gas Tank Shield. Suitable for both neat or mixed petrol, Gas Tank Shield stabilises the fuel and the removes water attracted by the ethanol found in modern fuel. Gas Tank Shield features Fuel Life Technology. Fuel Life is B3C Fuel Solutions proprietary nanopore reactive molecular sieve. Fuel Life removes the compounds in the fuel that promote fuel decay, once removed the fuel can no longer decay under normal conditions. Gas Tank Shield can be used in 5-25 litre cans. It’s re-useable up to 10 times, or for 1 year. Note: For the ultimate protection use in conjunction with Ethanol Shield. Step 1: Open package and insert Gas Tank Shield into the fuel container/tank. (Once opened, do not expose Gas Tank Shield to air for longer than 10 minutes). Step 2: Leave in the fuel container/tank for up to 10 tankfuls of fuel, or replace once a year whichever comes first).